Greetings to No.4 of my FlashPunk tutorial series! As announced in the previous ones, I’m going to show you this time how to have your avatar moving from one map to another, and also how to finally enter that house we placed in tutorial 2. your avatar current is. The complete code for the previous tutorial is here, and the one for this tutorial is available here. As you can see, we’re storing map related data here. The the embedded resource class, the xml that we take out of that, a string with the name of the map, the width and height and an index. The index is used to store the location of this map in the array we’re going to use in the Game world to store all the maps we’re including in the game. 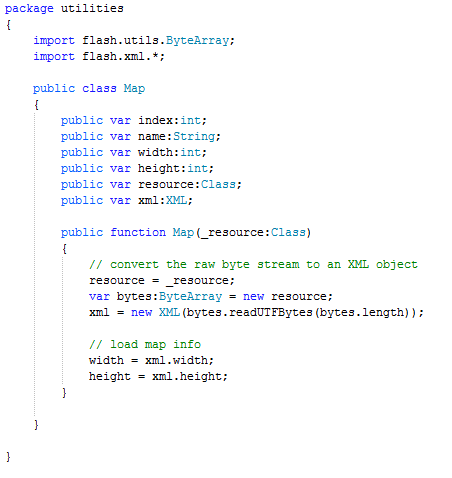 In the constructor you should recognize the procedure of converting the byte stream into an XML instance. After that, we just read the width and height in the xml and store them in the respective class variables. Ok, now let’s see how we’re using this new class in the Game world. 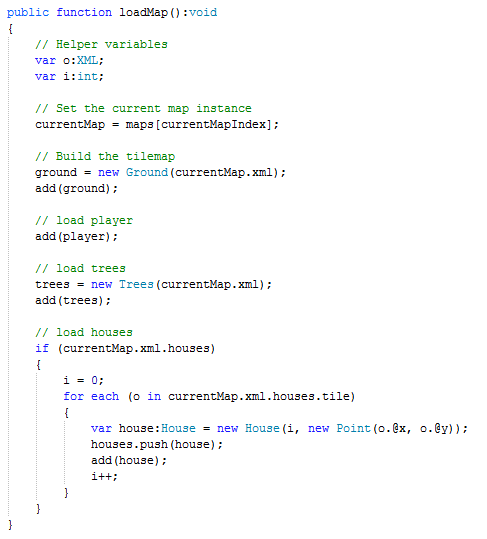 b) fix up the loadMap() function to load a map properly at all! We delete the part with the byte stream conversion and instead just set currentMap to the element at index currentMapIndex from the maps array. This should be the 0th, as we set currentMapIndex to that value earlier. 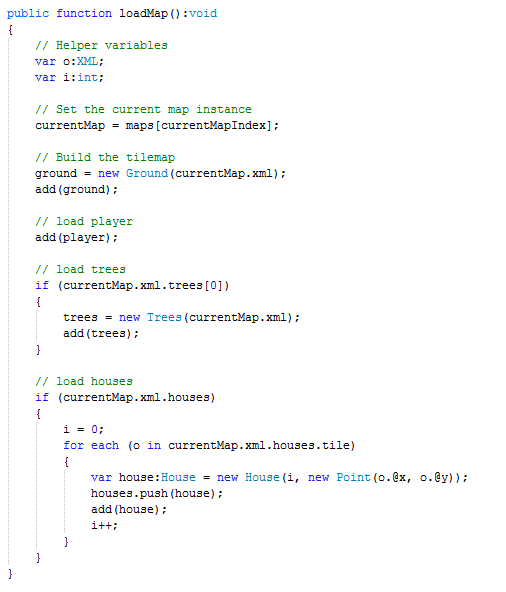 Everytime we need to get the xml of the map after that, we’ll serve it by giving it currentMap.xml. It’s easy. 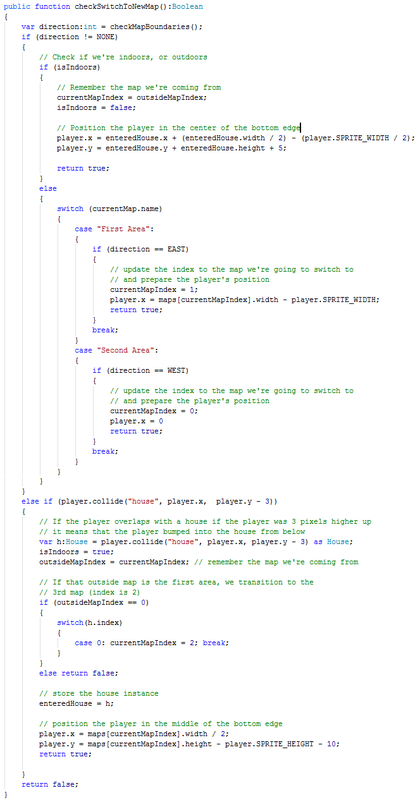 Now we can finally get to the code that actually switches maps. How can we do that? 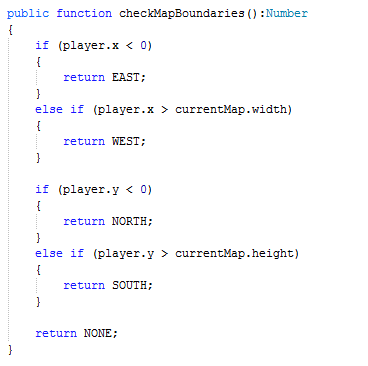 We can know at each frame if the player went beyond map boundaries thanks to checkMapBoundaries(), but we’re not going to call this function in there. We’ll write a new function that checks if checkMapBoundaries() returns something other than NONE, in which case we’ll check if there is a map in that direction from the current map. If there is, we’ll also change the player’s position, because he’s gonna be in another area next frame, so we need to make sure he ends up at the expected position. We remove all entities from the world (which doesn’t mean we’re killing them from memory), reload the map and adjust the camera. settings file, with the smaller dimensions of 624×768, which is the size of our flash player window. The next change is in the loadMap() function. Remember that our indoors map doesn’t have a <trees> tag and layer. 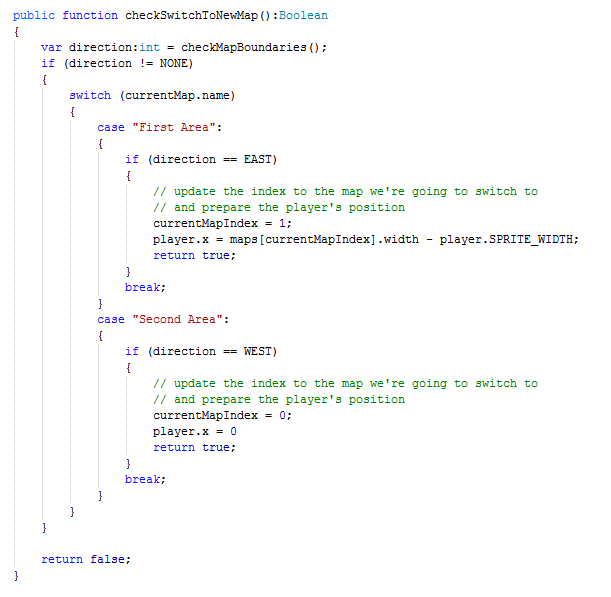 So we first need to check if there is such a tag in the map’s xml before we can try to instantiate the trees variable. For some reason, just checking for the tag doesn’t cut it, so we’ll just check if trees is true. Aside from checking if the player left to the north, south etc, we want to now make a collision check, namely if the player would have collided with the house if the player’s y coordinate had been a lower value (by like 3 pixels). We do this because actual collision with houses is being taken care of in the player’s movement code. If you think about it, this collision check will only return true if the player is bumping into the house from the bottome side. 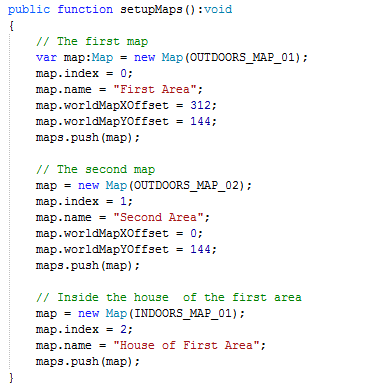 We also want to add a new index variable that stores the maps array index of the map that is the outside area of the house we’re entering. Call it outsideMapIndex. We don’t want to end up in the western area when we leave the house in the eastern area. It’s not a subway :D. And that brings us to the next problem. 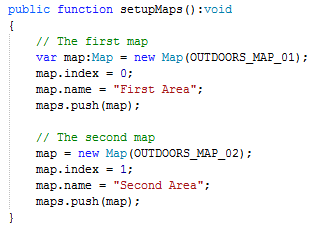 We want to add a special conditional in the checkSwitchToNewMap() function that checks if we’re indoors – because then, we’ll just switch back to the outdoor map whose index we kept earlier. Aand we’re done. We can now go between 2 outside maps, as well as go inside a house. You’ll maybe be wondering why I didn’t implement anything to allow us to walk into that second house on the western map. Well, if you really want to go in there, you can make your own implementation. You know how to do that now. Alright, one last thing to pay attention to here is that the x coordinate of the upper side of selections should be at 192. Next thing we’ll do is create a new Entity in the entities folder. Call it WorldMap.as. 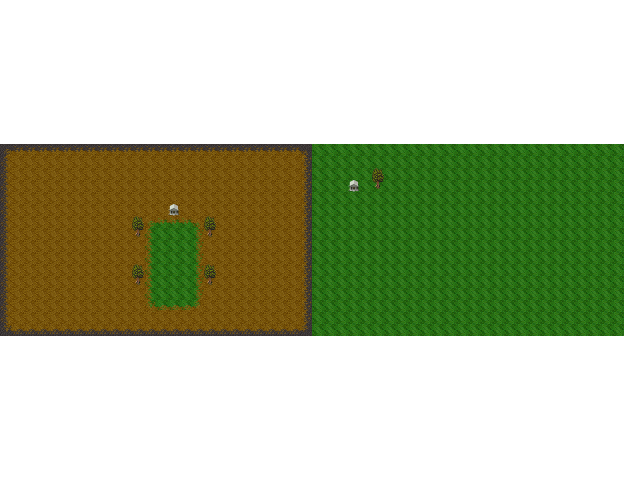 Predictably, we’re setting the boolean to true when opening the world map. 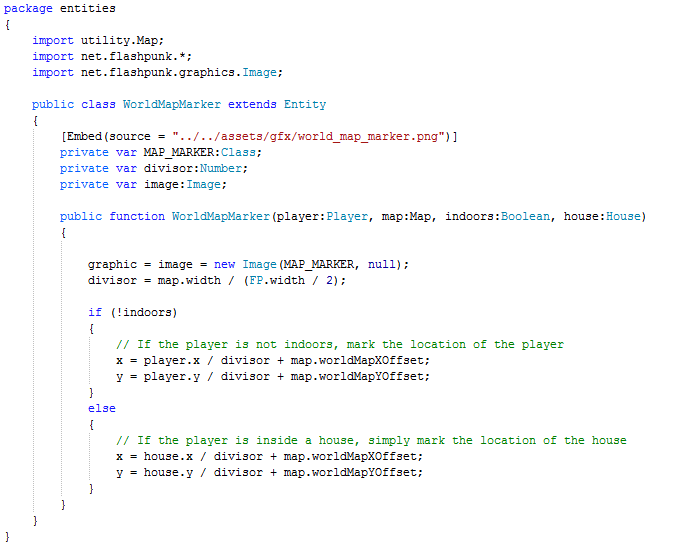 Then we remove all entities from the stage and instantiate the worldMap object. 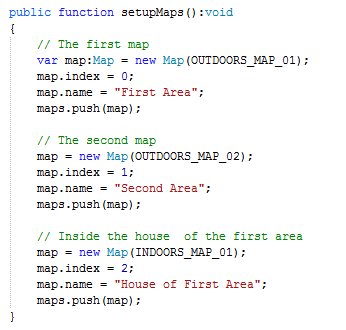 If we’re indoors, we call the worldMapMarker constructor with the enteredHouse object as parameter. If not, then we give it a null value. After all of that, we’ll place the camera back at 0,0 and the worldMap itself as well, to be sure. 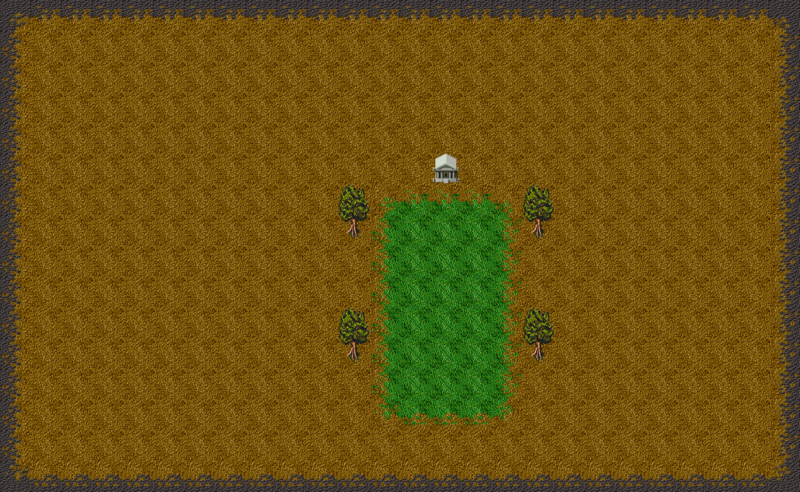 Then we add the worldMap and worldMapMarker entities to the stage. 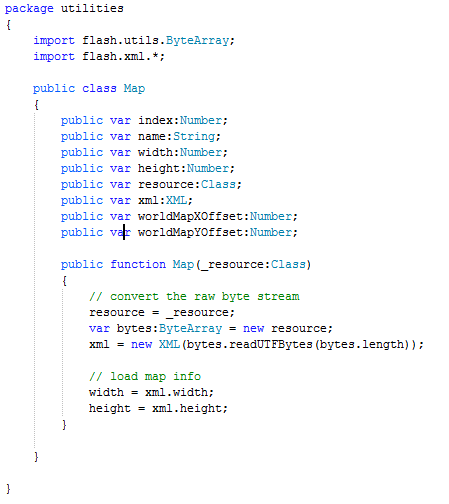 In the closeWorldMap() function we set the flag back to false, remove the 2 entities from the stage and call the loadMap() function. We then focus the camera back on the player. But wait! How can we just simply call the loadMap() function without setting the currentMapIndex back to the previous one? Because we never changed it. Remember, we didn’t move from one map to another, so al the previous state variables were still the same – the player position, the currentMapIndex and so forth. My god, I’m tired. Lol…I hope this tutorial was helpful. I even more hope that you give me feedback on what to improve, (or if you find bugs) and maybe how I can employ scripting in AS3 to make the code more flexible. 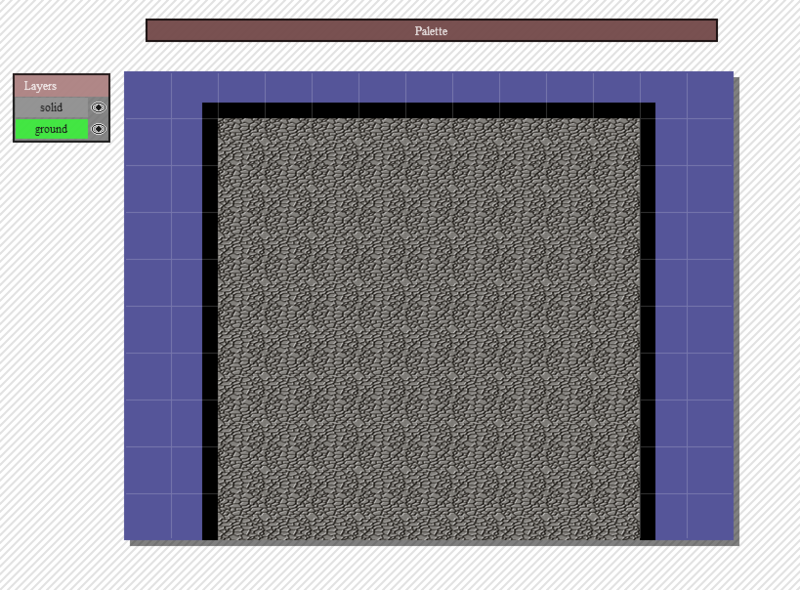 Next time, I’ll show some basic text displaying and we’ll add an NPC to the stage, making it walk around…..with A* Pathfinding! It’s gonna be epic! But for now…good night! Just wanted you to know that I really appreciate your wonderful tutorial series. I have learned a lot and am truly grateful for all your hard work. I eagerly await future sections. Anyway I just thought you should know that your work is very much appreciated and respected. Hi McFunkypants, all those points you named are on my list already (it’s a JRPG engine lol). 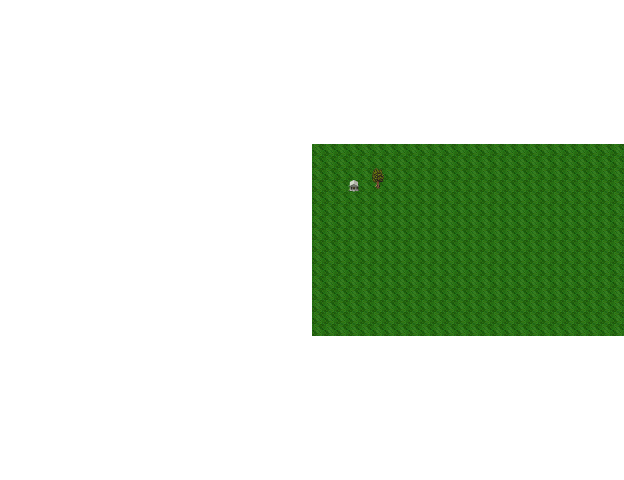 Right now, I’m pretty much concerned with the most basic features, and trying to make the foundation a good one, so that things like quests, stats, combat, inventory etc won’t go corrupting the code base and that at some point the code just gets so horribly jumbled up that I have to shamefully stop writing tutorials :P.